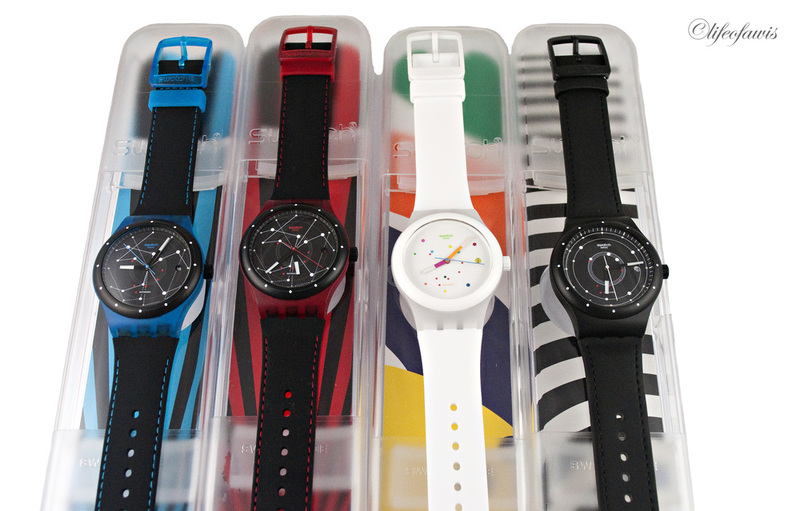 This Swatch Sistem51 (ref. SUTS401) was reviewed on 10 different criteria. The review is for this specific watch, other models may perform differently. Evaluation is based on my wrist size, personal opinions, experiences, and preferences. The Sistem51 does not look too different from other Swatch watches, which is good and bad. Good because it stays true to the brand's identity. Bad because, well... it looks like a Swatch. The last time I wore a Swatch was when I was in 7th Grade, and to be honest I never thought they would ever release something that I would be excited about until I learned about the Sistem51. Luckily, Swatch went a bit conservative when they designed the different variations of the Sistem51, making them more universally attractive. The four different models available of the Sistem51. The plastic and hermetically sealed case of the Sistem51 is 42mm. To keep it a classic Swatch, almost everything about the watch is made of plastic. The surprisingly thick case makes the watch a bit more "manly" and the open case back is a nice touch. On the white, red, and blue models, the area near the lugs has a translucent look which I find more distracting than attractive. Unfortunately, the Sistem51 was designed so that the case could never be opened. Which means that you will never be able to service the watch. Which also means that past the initial 2 year international warranty that comes with every watch, you will have no other choice but to throw the watch in the trash if there is something wrong with it. Even their cheaper quartz models allows the user to replace the battery... Glass on the front and back are of course plastic as well, so they can be easily scratched (and buffed out too). The seemingly random printed constellation design on the dial was apparently inspired by the late mathematician and astronomer Nicolaus Copernicus. Nice story behind it... but is it attractive? And with all the white lines and dots all over the dial, finding the hour and minute hands to tell time is a challenge. On the dial you will also find six red dots that correspond to the rubies on the movement (nice touch). There is also a small date display located at 3 o' clock. The second hand matches the color of the case and the hour and minute hands have lume at their tips. Hour indices also have a dot of lume. A closer look at the dial and you cannot help but think that it looks somewhat cheap, but at $150, I guess it is decent. All the lines and dots on the dial make telling time difficult. The blue version comes with a black silicon strap with blue stitching. The strap is incredibly soft and comfortable. The watch comes with a plastic tang buckle that seems delicate and fragile (specially the tongue). It is probably just a matter of time before it cracks or breaks. Strap is very comfortable and well-made, but the cheap plastic tang buckle seems too fragile. Now this is without a doubt the best part of the watch. Really the only reason to buy a Sistem51. 100% Swiss made (by machines nonetheless), 51 parts, 1 screw, and an amazing 90-hour power reserve. Just the power reserve alone still surprises me... The movement does not feature any grand complications nor is it decorated, but it is innovation at its best. As previously stated, the design on the dial makes telling time difficult. On the bright side, the hour and minute hands and the hour indices all have lume, so telling time at night will be easier than during the day. Go figure. The crown is a bit too small, making it difficult to pull it out to adjust the date or time. But once the crown was up, adjusting the date and time was easy. The Sistem51 features time (hour, minute, and second), date, open case back, water resistance to 30 meters, and an in-house movement with an impressive 90-hour power reserve. Oh, it also has a case that you cannot open... and many fragile exterior parts (plastic everything!). Being almost all plastic does have one advantage, it makes the watch very light. Combine the lightness of the watch with the soft silicon strap, and what you have is extreme comfort. You almost forget that you have anything strapped to your wrist. At $150, the Sistem51 packs a lot of innovation and history in one affordable package... but at the end of the day, it is a disposable plastic Swatch watch. A piece that every WIS should own, but its days are literally numbered (and so might the novelty factor).